I had to see it with my own eyes to confirm. LeBron James did not walk into the Miami Heat’s locker room. The Heat led by Dwyane Wade, topped the Houston Rockets 90-85 in the last home preseason game before they tip off the 2014-15 season against the Washington Wizards. When they open the season against Wizards it will be the start of the post LeBron era. Luol Deng is the key off-season acquisition who is expected to replace the four-time MVP. Deng was 2 of 7 and finished with four points. Wade scored 26 points, including a jumper that made it a two-possession game with 35.8 seconds remaining, and the Heat rallied from a 13-point deficit to beat the Rockets. Wade was 6 for 6 in the first half, the rest of the Heat were a combined 5 for 19 from the floor. There was no surprise Wade returned to South Beach, however Chris Bosh resigned with the Heat even after LeBron announced he was not returning. Bosh agreed to a five-year, $118 million contract. Bosh added 22 points in 35 minutes for the Heat, who went largely with starters against Houston backups in the final minutes. Mario Chalmers finished with 13 for Miami. Dwight Howard had 19 points and nine rebounds in his most extended action of the preseason for the Rockets, while James Harden added 19 points. I had a feeling in the past Dwight would be in a Heat jersey, I digress. Howard hadn’t logged more than 17 minutes in a preseason game; he had played in only two of Houston’s first five and his exhibition high-point game was 11. He topped those numbers in the first half alone, going into the break with 15 points in 18 minutes. I like the defending champion Spurs to come out of the Western Conference. 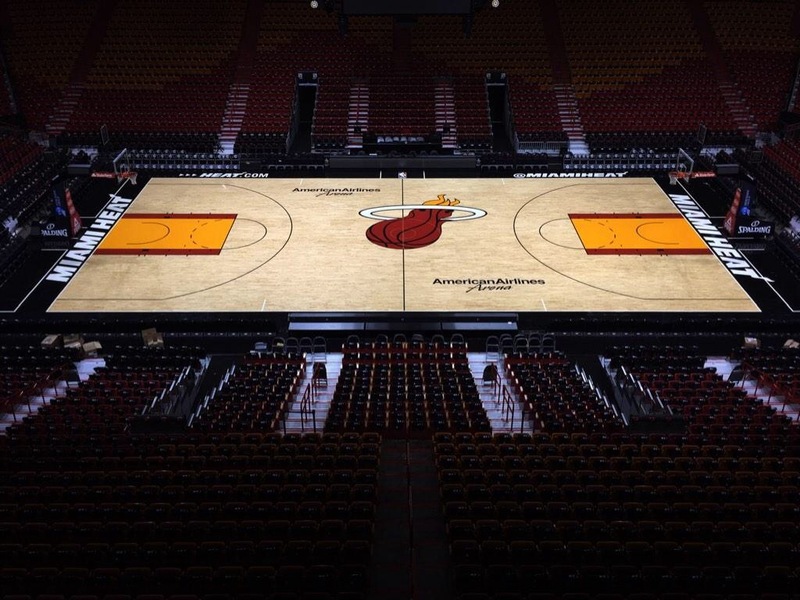 Miami unveiled a new court, with a virtually identical look to its old floor. The unpainted wood is a slightly lighter shade than the previous model, and the basket supports are a bit smaller and placed farther from the baselines than before. That may be new however it does not distract the fact that LeBron is officially back in Cleveland. Houston goes to Orlando on Wednesday, before finishing the preseason at home Friday against San Antonio. Miami’s preseason finale is Friday at Memphis.